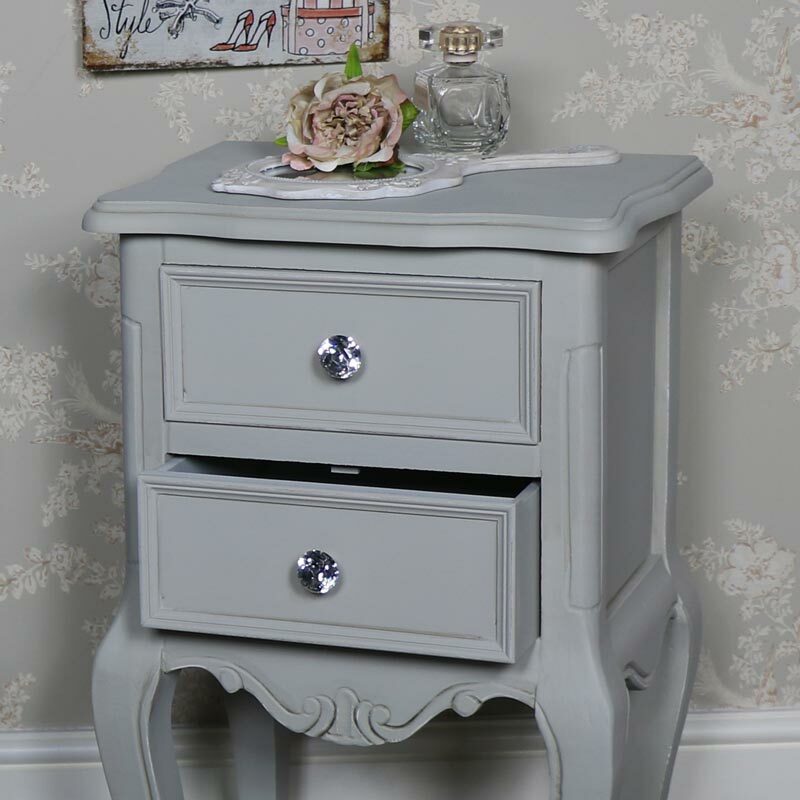 This pair of Elise Range Grey Two Drawer Bedside Tables are a fantastic bedroom storage addition for lovers of shabby chic, vintage or french furniture. 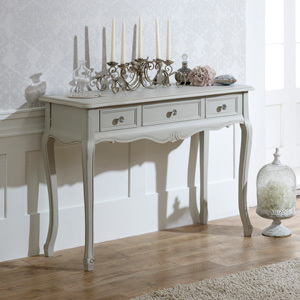 They have a pale grey painted finish, ornate carved detailing and glamorous crustal handles. 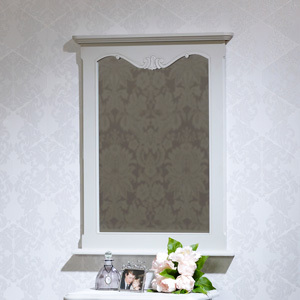 Ideal for a bedroom, nursery, living room or hallway. Can be used in a bedroom, living room, nursery or hallway use. 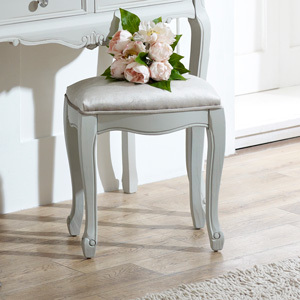 Ideal for lovers of grey decor and elegant furniture design. 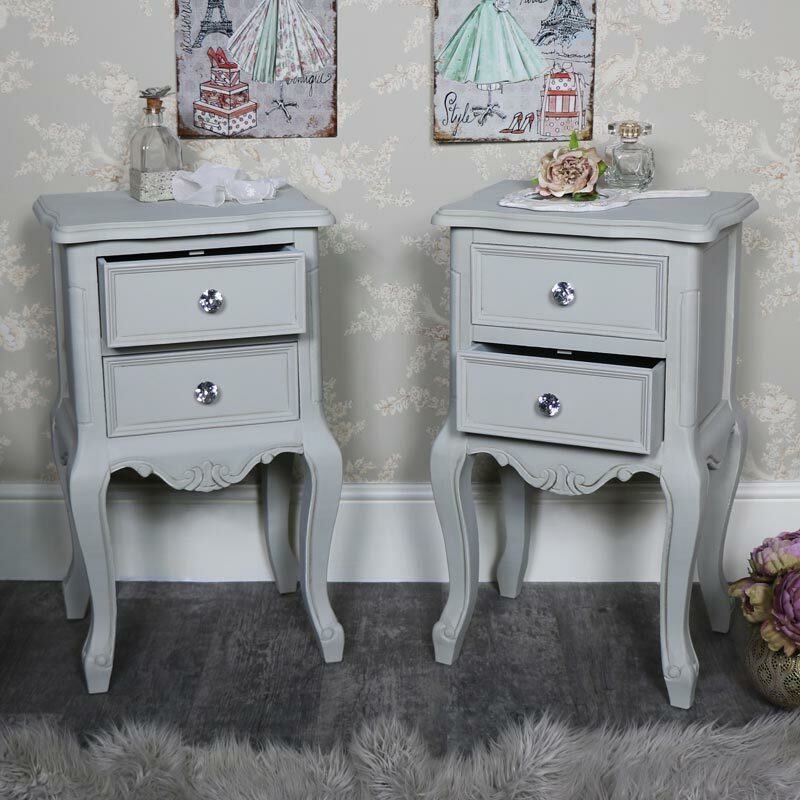 This set of 2 bedside cabinets are fully assembled and ready to use as a bedside, lamp tables or even in the hall as a phone table. 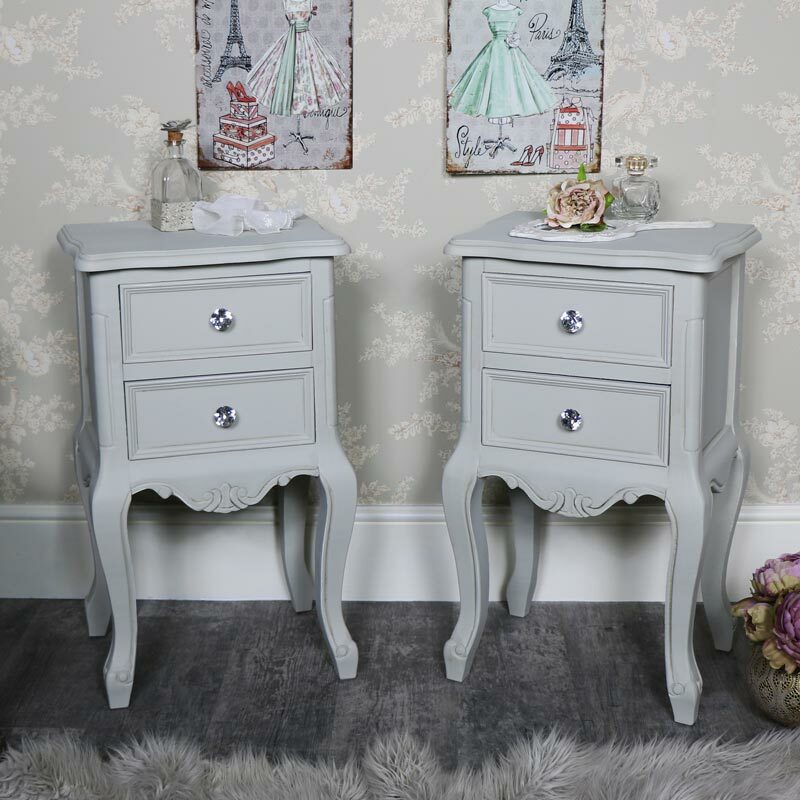 This pair of Elise Range Grey Two Drawer Bedside Tables are a fantastic bedroom storage addition for lovers of shabby chic, vintage or french furniture. 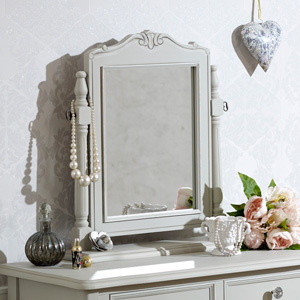 They have a pale grey painted finish, ornate carved detailing and glamorous crustal handles. 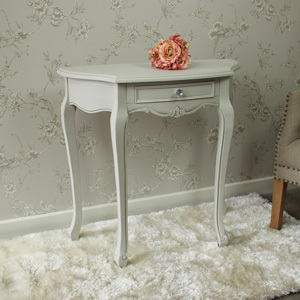 Ideal for a bedroom, nursery, living room or hallway. Can be used in a bedroom, living room, nursery or hallway use. 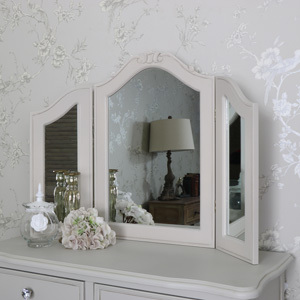 Ideal for lovers of grey decor and elegant furniture design. 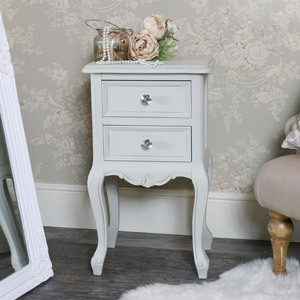 This set of 2 bedside cabinets are fully assembled and ready to use as a bedside, lamp tables or even in the hall as a phone table. 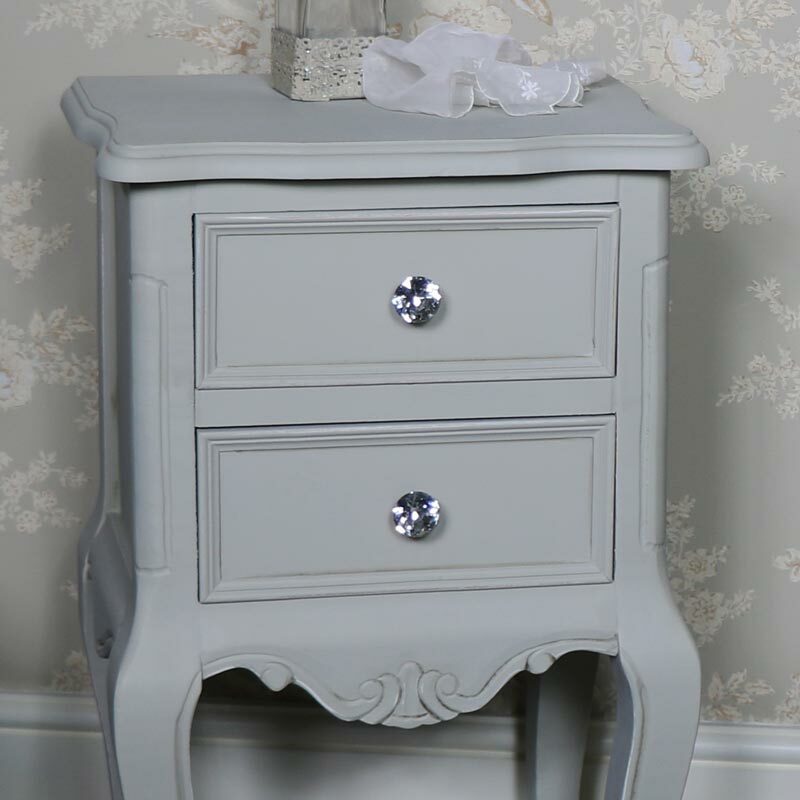 From the Elise Grey range, this 2 Drawer Bedside Table is painted grey and has crystalline knobs. It has curves to its top, its fascia and its legs, giving it an elegance to add to your furnishing of a room. 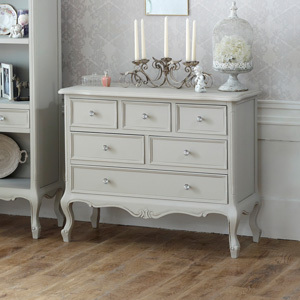 It is made from a combination of beech and birch wood and the paint has been distressed to give the antique look. There are other items in this range. The dimensions are 40 cm x 68 cm x 30 cm (width x height x depth).